Lending itself to a relaxed environment where comfort is placed at the forefront of value, this casual styled living room couch features a plush cushioned construction with classic sock arms and traditional wedge legs. 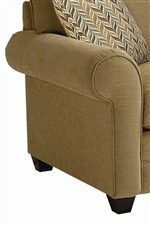 Bed pillow back and box seat cushions provide just the right amount of padding on this living room loveseat to create a relaxed sitting experience that will remain comfortable for many years. Complete with two 19 inch accent pillows, this sofa makes the perfect addition to quaint family homes seeking classic styled comfort. 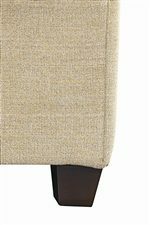 The Alex Casual Loveseat with Exposed Wood Legs by Bassett at AHFA in the area. Product availability may vary. Contact us for the most current availability on this product. Fabric Options Customizable Fabric. Fabric Option Only. Leg or Skirt Wedge legs with standard finish Vintage. Wood & Finish Wedge legs in standard finish Vintage. Customizable fabric options. Padding & Ergonomics Bed-pillow back and boxed seat cushions. Relaxation has arrived with Alex, a collection of upholstered furniture featuring rolled arms and exposed wood wedge legs in standard finish Vintage. Customizable fabric options make it possible for you to infuse your living room, family room or den with style and comfort. The boxed cushion seats and bed-pillow backs of the pieces provide the perfect place to sit and sink into requiescence. 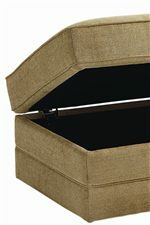 For extra storage options, the Alex ottoman has a hinged lift top so blankets and pillows can be close at hand. Infuse your home environment with good feeling and peacefulness by introducing Alex into your space, then kick up your feet and enjoy. The Alex collection is a great option if you are looking for Casual furniture in the area. Browse other items in the Alex collection from AHFA in the area.